LaserShip, a last-mile delivery company servicing the Eastern U.S. and parts of the Midwest, announced the launch of its new website, http://www.lasership.com, on June 30, 2017. The newly designed website is mobile-friendly and more user-friendly, and will give consumers the opportunity to make customer service inquiries through a chat option. The new tracking results page will allow consumers to subscribe to receive package tracking updates. The chat and tracking notification features are expected to launch later this summer. LaserShip’s last website redesign was done in 2012 using a content management system. The new version of the website was built by LaserShip’s in-house IT team, allowing for greater flexibility, control and security. 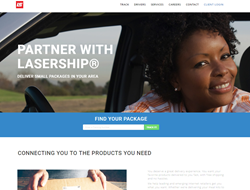 Founded in 1986, LaserShip is a parcel carrier facilitating last-mile delivery to the Eastern and Midwest U.S. for shippers that desire reduced transit times and increased flexibility within their supply chain. LaserShip has evolved into a leading provider of same-day and next-day delivery services for premier e-commerce and product-supply businesses. For more information, visit lasership.com.